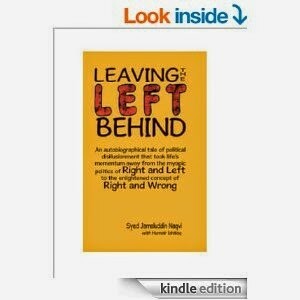 Professor Jamal Naqvi, one of the stalwarts of the Pakistani Left, recently wrote a book about leaving the Left behind. it has caused a stir..
Extracts: The fact is that Leaving the Left behind is the first book in Pakistan that confronts fundamentalism and defies the dogma of the left. Naqvi, who dominated the policymaking body of the left for the most part of the 1970s and 80s, has spared no one with his characteristic crisp and sharp wit…. His autobiographical account has been published recently under the title Leaving the Left Behind, which is self-explanatory. If someone wants to know more, he can read the subtitle “An autobiographical tale of political disillusionment that took the life’s momentum away from the myopic politics of the Right and the Left to the enlightened concept of Right and Wrong”…..
With nine chapters and two appendices in this 264 page volume, the 81 year old Jamal Naqvi has shared all that he had to with his comrades. You may not agree with him but it is important to acknowledge this wise effort. We hope our elders in the movement would follow his example and give us a chance to read more about our common past. …To return to the question, is capitalism a fair and just system? Marx never talked about fairness and justice of a political and economic system. What he thought of capitalism was stated plainly in the Communist Manifesto. Capitalism is a highly productive system. ‘The bourgeoisie cannot exist without constantly revolutionising the instruments of production.’ At the same time, for the capitalist labour is and will always remain a cost of production which it must try to minimise in order to maximise his profit. Class conflict is inherent in the system. in liberal democracies (and even in relatively liberal dictatorships), leftists are the personality type that is anti-authoritarian, pro-humanist, progressive and pro-reason. That does not mean they are always humane, progressive or reasonable, but those are their instinctive sympathies. Marxism (especially as developed by Leninist parties…and that was the default position for a century, even among those who thought they repudiated Leninism) channeled these worthy instincts into disastrous and atrocious byways for a century. In an another hundred years, it will be seen as one of the great disasters of human history…its appeal to certain emotions (mostly negative emotions, like envy, jealousy, fake self-esteem, lazy dogmatism, etc) ensured its popularity and it provided generations of intellectuals with the illusion that they (in many, not all, cases; lazy, incompetent, personally vindictive and small-minded people) were the lonely heroes of history, struggling to overthrow the tyranny of evil men. That was another of the poisonous gifts of this ideological current. The worst, of course, was the fate of those societies where this current (usually in combination with an unusually incompetent and venal ruling elite) reached critical mass and managed an actual revolution. In EVERY case (except maybe Cuba, where the corrupt elite collapsed with such little bloodshed that the worst excesses did not play out) it led to horrendous suffering and disastrous dictatorships and cultural setbacks from which many countries have yet to recover…..
which is not to say that “Leftists” did not do anything good. far from it, all positive movements of the last 100 years (anti-colonialism, anti-racism, feminism, prisoner’s rights, gay rights, human rights, etc etc) had leftist support. But that support worked best when it was in countries where the “left’ was in no position to actually cause a revolution…. To which i responded: I was indeed talking about coffee-house intellectuals and about a lot of ordinary people who gravitate leftwards..not so much about actual party workers.